Ok, so as usual I am seriously late with these pictures. (Like you're all sitting there on pins and needles waiting. ;D) But here they are! It's hard to imagine he's 14 months already (15 in a week and a half). 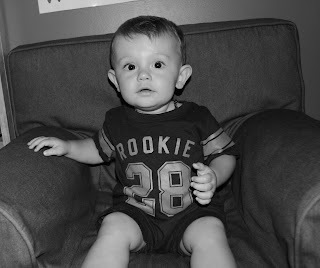 In fourteen short months he has gone and gotten so big. He's walking ALL OVER the place. He climbs, and throws things in the trash and has temper tantrums when he doesn't get his way. Good thing he's so darn cute!!! Glad I'm not the only slacker. Wyatt will be 9-months on Saturday and I *JUST* took his 8-mo photos this morning. Oops.